Holiday China Tour specializes in join-in group Xian bus tours service for individual or small group travelers to save time and money and see the best of Xian. Our Xian bus tours cover the most famous scenic-spots include Terracotta Warriors, Big Wild Goose Pagoda, Ancient City Wall, Huaqing Pool and Tang Dynasty Show in Xian. We provide hotel pickup and drop off service. Join our Xian bus tour you will see the most famous attractions of Xian at the lowest price. Daily departure Half Day Terra-cotta Warriors Tour lunch included. Daily departure Xian Bus tour to visit famous historical attractions in Xian city such as the Big Wild Goose Pagoda, the Ancient City Wall, the Bell Tower or the Drum Tower. Day 2 Join in Li River cruise bus day tour. Day 3 Join in Longji bus tour, depart from Xian or Yangshuo. Day 1 Airport to Hotel Transfer. Day 2 Join in group tour to Big Wild Goose Pagoda, Ancient City wall. Stay in Xian hotel. 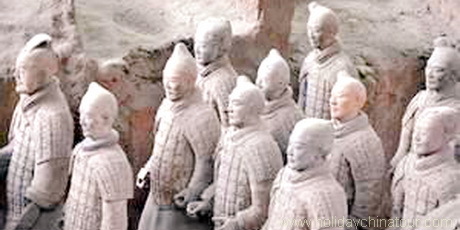 Day 3 Join in group tour to Terracotta Warriors, Transferred to Xian airport. Day 1 Xian airport pickup and stay in star hotel in Xian. Day 2 Join in Xian bus day tour. Stay in Xian hotel. Day 4 Transferred to Xian airport.